Poker is an addictive activity to get involved in. more so, if you are playing online. It is not unusual to find yourself immersed, whilst seated, to the game for hours on end. Before you know it, you have aches and pains. 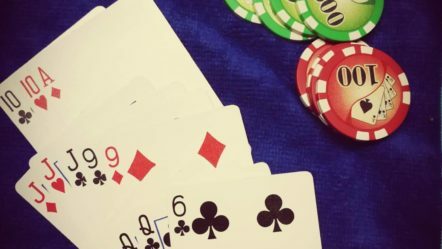 Along with this prolonged playing time, you might even wonder why you are having a losing streak – it is your mind not being able to process the cards better because you have become unhealthy. The brains process information regularly but poker players often allow little time to move from their chair and do some stretching. Yes, poker is a mind sport. Still, players need to be fit in order to make productive decisions on the felt. One does not have to be super fit like those athletes who would compete on the Olympics, but online poker players need to be healthy to at least maintain a sharp mind and right physique. Sitting on a chair for long hours is an activity most online poker players are guilty of. Eating the proper food and maintaining a daily routine of exercises help in revitalizing the body and mind which is crucial in translating to big wins on the table. In Taiwan, a guy named Hsieh died whilst playing online video games for three days straight. He suffered a heart attack and died in the internet café. Poker players may also experience this if they are not careful enough to check on their frequent headaches, blurry vision, and sleep deprivation. More than winning on poker tables, players must make it a top priority to have a healthy diet. Having a full breakfast, lunch and dinner plus scheduled light snacks is important to refuel. So, you don’t feel full and you have enough food in your system, it is best to have a small snack at least two hours before lunch, and dinner. Make sure to include healthy portions of fruits and vegetables. Foods rich in fibre is best during breakfast to help you jumpstart your day. Remember to avoid carbohydrate-rich foods at night time, particularly if you have poor metabolism. These berries are known to contain loads of antioxidants and vitamins. The Acai berries have protein and omega-3 fatty acids whilst the blueberries are known to improve coordination, vision, and cognitive functions – all of which are needed when playing online poker, particularly those playing in multiple tables. Cacao Beans, yes, the same one that makes your favourite chocolate bar, is a great snack to have. No, you only get the full benefits by downing a whole bar of an average chocolate. You have to consume either a bar of dark chocolate or 100% organic non-alkaline cacao powder. These beans are rich in flavonoids, theobromine, catechins, and antioxidants, all are linked to higher cognitive functions, happiness, and general mood improvement. Cacao beans help the brain in releasing chemicals allowing you to maintain a positive aura on the table. For some health buffs, coffee is a no-no. This is because they fail to acknowledge the rich antioxidant properties of coffee. In addition, it is also a good source of vitamins and minerals and amino acids. Moderate intake of coffee is actually beneficial for the brain, specifically the espresso. Drink it without sugar and milk to experience its full brain benefits. Coffee is a great pick-me-upper and the best fuel for the brain to help you stay alert when making good calls and raises. Matcha may be a great alternative for those who dislike coffee. The great thing about this pure and rare tea is it is okay to consume all at once as it can serve as a drink and a meal. It has lots of nutrients, chlorophyll, and amino acid L-Theanine, which helps you relax and calm when you are in a tight grind. It has antioxidants, Vitamin C, Vitamin A, catechins, and fluoride. Aside from being a satisfying meal to have, salmons are great sources of omega-3 essential fatty acids whilst having low levels of saturated fat. Having a wild salmon sandwich during snack time can help you improve your brain function and even decrease the risk of developing Alzheimer’s disease, dementia, and stroke. Sitting too long can have repercussions on your overall well-being. It can cause slower metabolism, bad posture, back pain, spine injuries, metabolic syndrome, and chronic pain. If you want to continue playing online poker until your hair starts to grey, it is time that you engage in some physical activities to help you stay healthy. You don’t have to enrol in a spinning class or sign up for a gym membership, which may only cause you to fail in your fitness journey. Having a regular physical activity such as a combination of cardiovascular exercises and strength training is a great start. If you are not a physically fit person, we highly suggest that you start slow, listen to your body and pace yourself. It is much more important to do little exercise than to do it all at once, tire your entire body, and stop. Your regimen must be something you can stick to at least several times a week. It is also good if you can purchase an ergonomic chair so that no matter how long you stay seated, you can maintain a good posture. Make sure your monitor level allows you to play comfortably. Remember, your wrist should be lower than your elbows with your knees a bit higher than your hips. Always make sure to take a few minutes of breaks in between. To make sure you stick to it, set an alarm for it. Stretch your arms and legs for two minutes after every 30 minutes. When you notice you have been playing for about an hour already, take a 5-minute break. During tournaments, you can time these breaks when there are breaks in play. Whilst you are on break, you can do 10 squats to stretch your legs and gluteus muscles. You can also do calf raises in between. Your eye is your best tool when playing online poker, so make sure they get the proper TLC from you. Rest your eyes often. You can reduce eye fatigue by refocusing your eyes from time to time. Do this by covering them for about 15 seconds. Set aside a time per day dedicated to exercise. Attend to it religiously. When you are playing, you can still do little exercises to keep your blood circulating properly. Stretch your wrists and maintain proper posture at all times. Whilst seated, you can contract and hold both your abdominal and gluteus muscles repeatedly. Do a series of jumping jacks for 30 seconds. This is a wake-me-up exercise because it allows your arms to stretch and open up the chest. Plus, it helps elevate the heart rate – allowing blood to properly circulate in your body. Another 30 seconds of fast feet would help you maintain a level of focus that would help you jumpstart your day. Poker players need the added boost of focus and doing fast feet can give their brain and nervous system something to work on. Planks are quite challenging to do that may make 30 seconds seem like an eternity but this exercise, if done properly, can do so much for your core muscles. Again, another good exercise for focus – as it is needed to stay in correct form. This move lets you wake up your muscles. It is also great for stretching the oblique muscles with a few efforts. This exercise allows you to use your muscles supporting your spine. It opens up the front of the body as you massage your core muscles. You can do these exercises for two sets to help pump up your blood. After these exercises, grab a healthy breakfast to start your day. You can be assured to have a great game of poker every time.